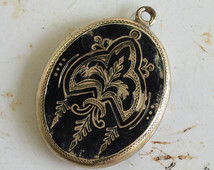 A locket by definition is “a small ornamental case for a photograph or other keepsake which is usually worn as a pendant” on a simple chain but lockets can also be in the form of a ring or brooch. In this post, I will discuss the history of lockets and end with some examples of a few special historical lockets. 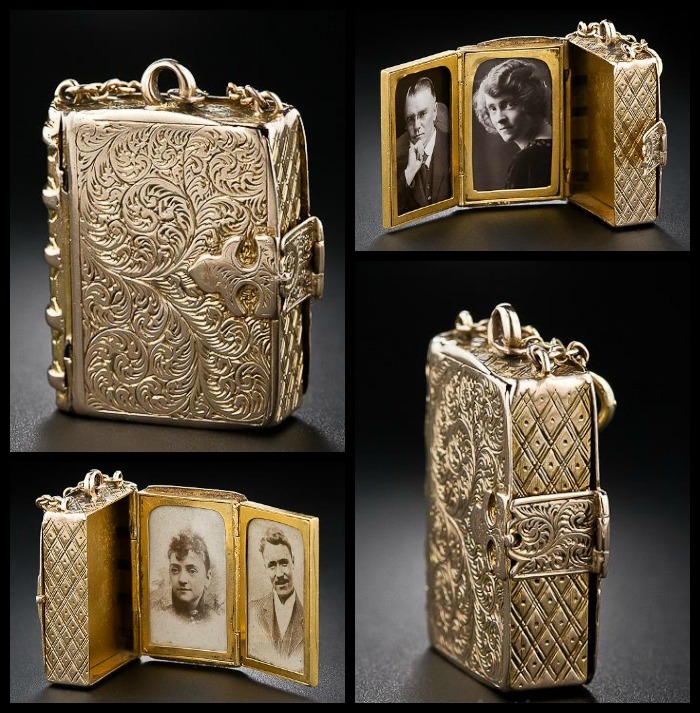 Modern day lockets evolved centuries earlier from amulets (an ornament or small piece of jewelry) which were thought to give worn for protection against evil, danger, or disease. 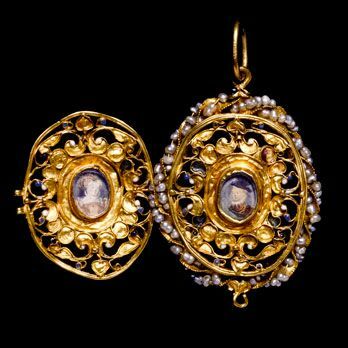 In the Middle Ages or the Renaissance, early lockets were worn by either women or men and could be a pendant, a ring, a brooch or a watch fob. People would frequently display miniature portraits of loved ones or sometimes small pictures of the King or Queen to show their loyalty to the crown. Sometimes the lockets were made with small openings in which small perfumed fabric squares were placed to camouflage the stench for the unpleasant sanitary conditions. 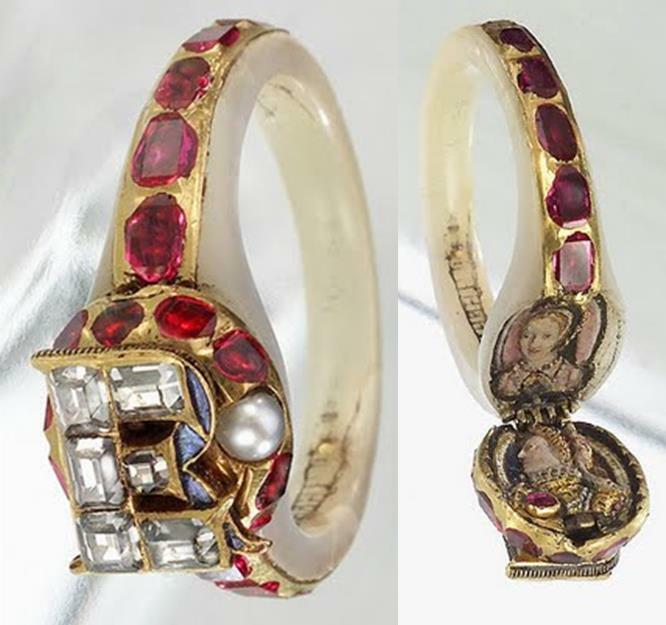 Mourning jewelry became popular in the 17th century with the execution of Charles I in 1649, supporters of the former King secretly wore miniature portraits of him set in lockets and rings. Later in the 18th century, mourners wore intricately decorated lockets in which locks of a “dearly departed” family member were arranged in a special way. 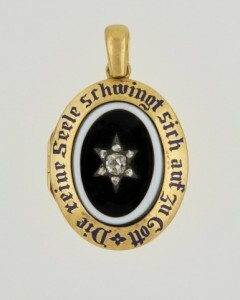 Mourning jewelry increased in popularity in the Victorian era after the Queen’s husband, Prince Albert, death. As the Queen went into a long period of intense mourning she wore a special locket dedicated to the memory of her beloved husband which set a fashion trend. An entire jewelry industry was soon started that specifically produced affordable items for the upper and middle classes. 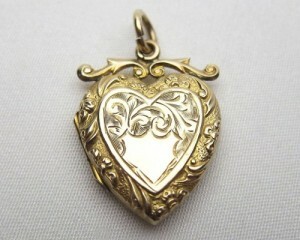 Today, lockets are available in a variety of shapes and sizes; the most popular is the sentimental heart shape. 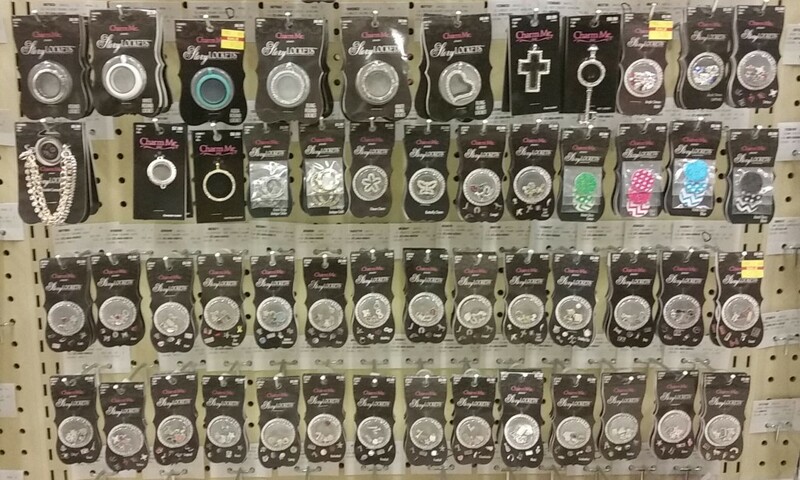 Lockets make great gifts for special occasions such as birthdays, anniversaries, christening or other religious ceremonies and also for holidays like Valentine’s Day and Christmas. Traditional styles are available in a variety of precious metals such as gold or silver and can be embellished with gemstones such as diamonds or pearls. Most recently the more modern “floating charm” lockets have become very popular and are available with several different choices of charms and other inserts such as engraved discs with special messages. Described below are the various types of lockets that are available, some new ones can be purchased at a fine jewelry or department store while the vintage or older ones can be purchased at antiques stores or online at sites such as eBay. 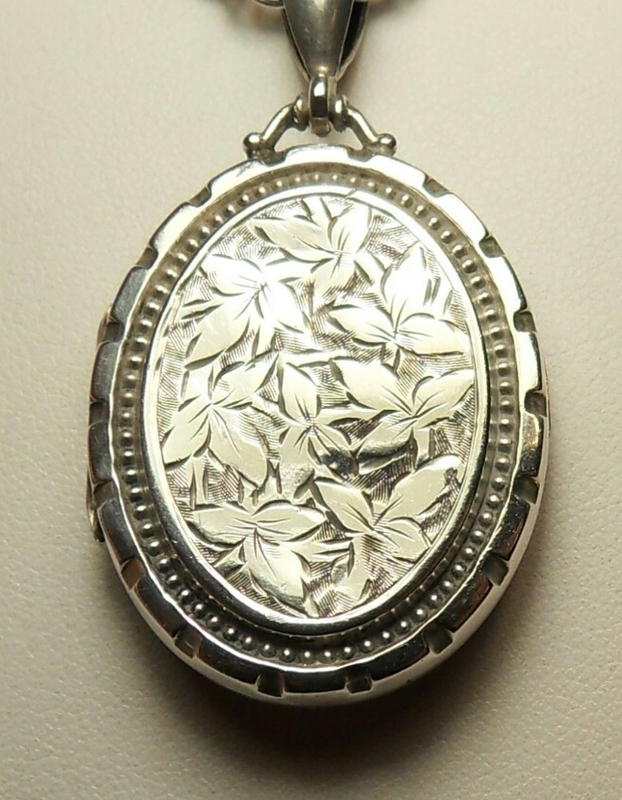 Special Note: When shopping for a vintage locket here are some tips – the locket should be in good condition, check the hinges and interior, avoid lockets that are damage or heavily scratched. Keepsake Lockets – This type of locket can make a wonderful gift to commemorate a special occasion such as a birth, a first communion or wedding. Usually keepsake lockets have a space in which to place a small photo behind a plastic cover or a glass enclosure to place a lock of hair or other small memorabilia. This style of locket is perhaps the most popular one. 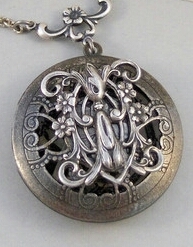 Vintage Perfume Lockets – As previously mentioned, centuries ago lockets were sometimes made with small filigree style openings in which perfumed fabric squares were placed inside to camouflage the stench due to unpleasant odors from limited personal hygiene and rather disagreeable smells from sanitary conditions in the streets. Today, perfume lockets can be made as a DIY craft project and if you are interested in creating your own I would recommended a search on the internet for the supplies required and instructions to create your own. 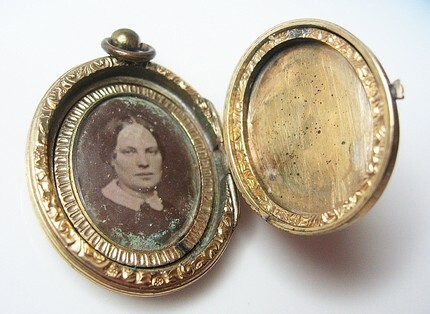 Vintage Daguerreotype Picture Locket – This variation of a keepsake locket featured a Daguerreotype photograph. The process was first introduced in 1839 and in the following decades it became less expensive to produce so that small daguerreotypes could be used in watch cases, fobs brooches and lockets. The soft metal daguerreotypes could be reduced in size and then set and sealed behind glass. 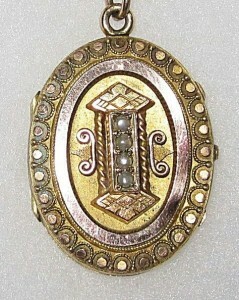 These types of lockets were very popular in North America at the onset and during the duration of the Civil War. Mourning or memorial lockets – Mourning lockets have been around for some time and in England, during the Victorian Era, they were especially popular. 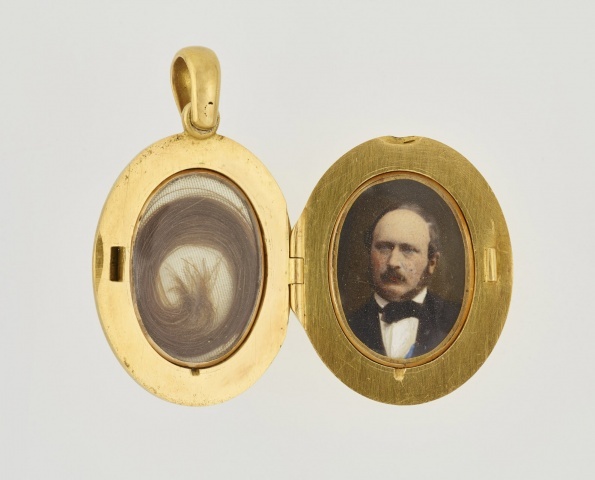 This might be possibly due to the fact that Queen Victoria was in deep mourning after the death of her husband and she wore a locket which contained a small daguerreotype of Prince Albert and a lock of his hair, this set a fashion trend. The next locket holds a historical piece of wartime memorabilia and it contains the bullet that killed Admiral Horatio Lord Nelson at the Battle of Trafalagar in 1805. 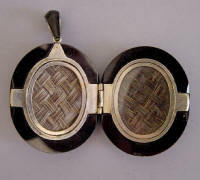 The locket is currently part of the Royal Collection Trust. The bullet was fired from a French naval ship the “Redoubtable” and hit Lord Nelson’s in the left shoulder passing through his spine and vertebrae and lodging just below in his right shoulder. Lord Nelson was carried below deck and the bullet was removed by a surgeon named William Beatty on board the HMS Victory but the wound caused fatal damage to Lord Nelson’s lungs and spine and he died three hours later. 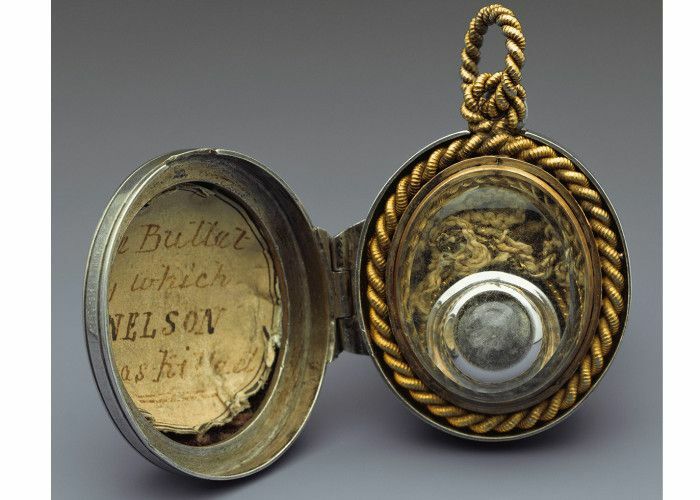 Lord Nelson’s posthumous victory over the French and Spanish fleets made him a national hero and afterwards the bullet, with a piece of Lord Nelson’s naval uniform still attached, was set in a crystal case locket which Surgeon Beatty gave to Queen Victoria in 1842. 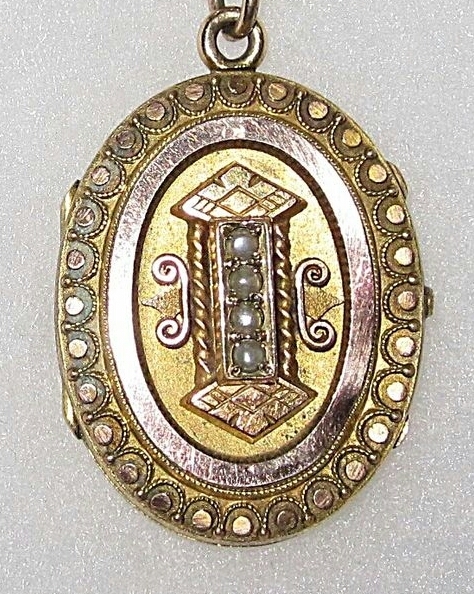 Shown below is a small memorial locket which is said to have belonged to Queen Victoria. 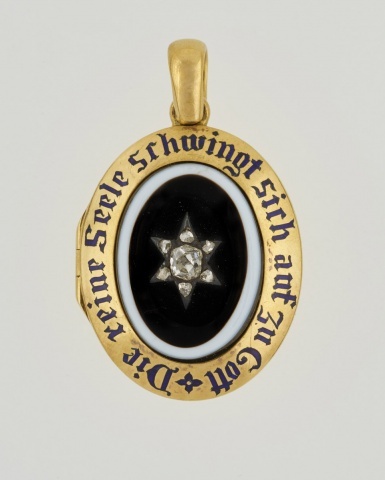 The gold locket features an oval onyx and a diamond “star” set in the middle with an blue enamel inscription around the boarder that reads “Die reine Seele schwingt sich auf zu Gott” in German, the English translation is “The pure soul flies up above to the Lord”. Inside the locket on the left is a lock of hair and on the right is a small photo of Prince Albert who was Queen Victoria’s husband. When he died in 1861 at Windsor Castle, the Queen went into a deep period of mourning and she ordered that the Blue Room in which the Prince died would be left perpetually as it was on the day that he died, the “Albert Locket” was place in the room, and this promise was kept until her own death in 1901.